Micro and Nano Engineering and Acoustics and Dynamics; Micromachined ultrasonic and opto-acoustic transducers, atomic force microscopy, and medical ultrasound imaging. Dr. Degertekin worked in the area of acoustic microscopy, ultrasonic sensors for semiconductor processing and modeling of wave propagation in layered media before focusing on microscale devices. Dr. Degertekin began at Georgia Tech in 2000 as an Assistant Professor. Prior, he was an Engineering Research Associate at the E. L. Ginzton Laboratory at Stanford University. The research in atomic force microscopy uses micromachining technology to implement novel probes and actuators for fast imaging, single molecule force spectroscopy, and quantitative material characterization and subsurface imaging at the nanoscale. 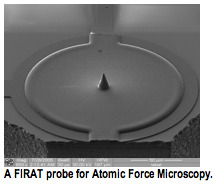 This effort has resulted in the FIRAT (force-sensing integrated readout and active tip) structure which combines integrated electrostatic actuation and optical interferometer for sensitive force detection in a microscale AFM probe (http://www.gatech.edu/news-room/release.php?id=858). The speed and controlled dynamics of this probe is exploited for fast topography and TRIF (time resolved interaction force) mode imaging. Another aspect of the AFM research explores the imaging capability of this instrument for subsurface defects that can be found in semiconductor electronics structures through modeling and experiments. The work on single molecule force spectroscopy is performed in collaboration with Professor Cheng Zhu, and aims to increase the throughput by parallel operation of membrane based probes as well as to improve the resolution and speed to widen the application space of this technique. The group's research on capacitive micromachined ultrasonic transducers (CMUTs) focuses on development of new CMUT structures with improved performance using the advantages of microfabrication technology, and design and implementation of catheter based imaging arrays for intravascular and intracardiac ultrasound imaging for interventional cardiology applications. These CMUT arrays are fabricated using low temperature processes enabling post-CMOS electronics integration. The projects in this area involve transducer design, array and image processing algorithm development, custom CMOS electronics design and fabrication, and finally evaluation of the devices on phantoms and animal models. This work is performed in collaboration with Prof. Paul Hasler (GT ECE) and Prof. Mustafa Karaman (Isik University, Turkey). In the area of micromachined microphones, Dr. Degertekin's group has developed opto-acoustic devices that use miniature interferometric displacement readout systems based on optical gratings. This approach decouples the electronic readout sensitivity and the mechanical pressure sensitivity: a significant bottleneck for conventional capacitive microphones. This approach is also used to implement novel biomimetic directional microphones for hearing aids in a project performed in collaboration with Prof. Ron Miles of Binghamton University. Current focus of the research thrust is to use the electrical port available in these optical microphones for force feedback. With the extremely sensitive built-in optical interferometer, this approach may lead to highly sensitive micromachined microphones with low thermal mechanical noise and broad bandwidth, and micropohone arrays suitable for small, high sensitivity sound intensity probes. The work in the Degertekin lab exposes the students to applied physics, electrical, mechanical and biomedical engineering, biology and biomimetic systems and to latest technology for microscale and nanoscale device development. In the end, the students get a thorough theoretical and experimental education in acoustics and optics, while learning to perform interdisciplinary research. Highly-sensitive Displacement-Measuring Optical Device, U. S. Patent 7,116,430, with N. A. Hall and W. Lee, October 3, 2006. Z. Parlak and F.L. Degertekin. 2008. Contact Stiffness of Finite Size Subsurface Defects for Atomic Force Microscopy: Three-dimensional Finite Element Modeling and Experimental Verification. Journal of Applied Physics103, 114910. H. Torun, et al. 2007. Micromachined Membrane-Based Active Probe for Biomolecular Mechanics Measurement. Nanotechnology 18, 165303. A. G. Onaran et al. 2006. A New Atomic Force Microscope Probe with Force Sensing Integrated Readout and Active Tip. Review of Scientific Instruments 77, 023501. R. O. Guldiken, J. McLean, and F. L. Degertekin. 2006. CMUTs with Dual-electrode Structure for Improved Transmit and Receive Performance. IEEE Transactions on Ultrasonics, Ferroelectrics, and Frequency Control 53, 483-491. N. A. Hall, et al. 2005. Micromachined Microphones with Diffraction-Based Optical Displacement Detection. Journal of the Acoustical Society of America 118, 3000-3009.